TouchPoint Check-In software is web-based and is available to all TouchPoint clients without any extra fee. However, the Check-In software must be installed separately on each PC or an all-in-one computer that you plan to use for Check-In. Check-In is designed to work with a touchscreen monitor and a thermal label printer. The computer must have the full version of Windows installed (version 8 or above) and a touchscreen. Also, be sure to have the latest printer driver installed (required). You can install this software on a Mac using Parallels. However, because Macs do not have an interface with touchscreens, this is not recommended. It will not be a positive experience for your users. You have a number of options for the setup you use. The computers can be placed in a box-style kiosk using a PC and separate touchscreen monitor. Or you can have a sleek-style kiosk made, using an all-in-one model computer, or a very small PC with a touch screen. Some churches have mounted the monitors on the wall with the computer in a locked cabinet. Or, you can just set the monitor on a counter with the PC on the floor below it. If you are using the Check-In software for secure child check-in, you will need a thermal label printer in order to print the security labels. Check-In will work using any type of thermal label printer. We mention Godex printers because we have tested them, used them, and have had a very good experience with them. We are no longer recommending the Datamax printers as they print far too slowly. If you choose a printer other than Godex, keep this in mind: typically, the lower the price of the printer, the higher the cost of the labels. Some other well-known printer vendors that our clients have had good success with include Brother and Dymo brand printers. Godex Printer DT-4 Thermal label printer. These can be purchased from any vendor. These are the types of labels you can use. See note above about purchases if you decide to use a Godex printer and/or 2-inch labels. The kiosk houses the computer, keyboard, mouse, monitor and printer, providing easy access for children and adults. It measures 30”W X 38”H X 20”D and comes with four locking casters for ease of movement and storage. Wire management is incorporated. The kiosk is stained or painted; the topcoat is a high wear conversion varnish. The PC can be stored on the shelf below with the monitor and the printer on the top. This closes and locks. This style has an all-in-one computer built in with a printer shelf that slides forward for easy access. It has locking doors on the back as well. For Mobile Check-In, you can use any sized iPad 3 or higher, iPad Mini 2 or higher, iPad Air 1 or higher, or iPad Pro 1 or higher. All of these devices and the devices in their families after them have 1Gb of RAM or higher. Download the app from the App Store and make sure you install the latest updates. We recommend that you change the settings on the iPad so that it will update the TouchPoint Check-In app automatically when we push out a new version. With the iPad 2, we have had a few clients experience the closing of apps. We believe this is because that version has less memory. Also, you cannot install the latest version of the operating system on it. That is why we do not recommend using that version for Check-In. You can use any sized Android tablet and download the app from Google Play . TouchPoint Check-In is also in the Amazon Appstore and this app will work great with their Amazon Fire tablets. These can be purchased very inexpensively. You install TouchPoint Check-In on your device just like any other app. Make sure your tablet will allow you to download apps from either the App Store , Google Play or Amazon Appstore . To print labels from Mobile Check-In, you will need a PC with TouchPoint Check-In installed, with a printer and labels as described above. You will probably want to mount the tablet either on the wall or on a counter, or use a freestanding tablet holder. Another option is to purchase a movable tabletop tablet holder. Here is an example of an iPad mount that we have used. It has 2 parts - the base and the section where the iPad attaches. That section has a powerful magnet that adheres to the base. This actually comes with 2 bases - one with suction cups for a counter-top and one with screws to mount to the wall. 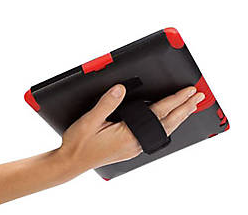 It is from www.zephyrhardware.com and is called the Pad Grip. Below is a picture of a freestanding holder that has a locking case that mounts to the top. The one below is from iPadEnclosures.com. You might prefer to use a hand-held case that a volunteer could use to help people check in. This might not a great way to handle check-in on a permanent basis, but it would work temporarily until you decide how you want to mount your tablets. Or you might use these for a special event for Check-In. If you plan to take photos during either normal Check-In or Building Check-In, an external webcam is probably the best way to go, instead of using the built-in camera. With an external camera, you can make necessary adjustments to get the right light, and the right angle. If you are using it exclusively for taking photos during Check-In, you do not need movie capability nor do you need speakers / microphones. However, it is OK to have a webcam with those features. Here are a few suggestions. But you can search on Amazon for further options.